Theresa in Spoleto sporting skorts. I hope my pilgrim friends will forgive me for this, but I have to say it: of all the people I’ve walked with in 3,500 kilometers of pilgrimages my favorite walking partner is my sweetheart, Theresa Elliott. I’m not just saying this because of how I feel about her. No, there are some specific reasons why I get a kick out of walking with this amazing woman. I’m not sure exactly what it is. Maybe it’s the skorts. See? Skorts are part shorts, which comes in handy if you’re riding a lion. For the uninformed, skorts are a combination of shorts and skirt, in this case made of Spandex®. Theresa found two pair at Costco before leaving Seattle and she’s worn them almost every day while walking. Even for pilgrim women a hiking skirt is a little uncommon, but Theresa has proven skorts a great choice for hot weather walking. 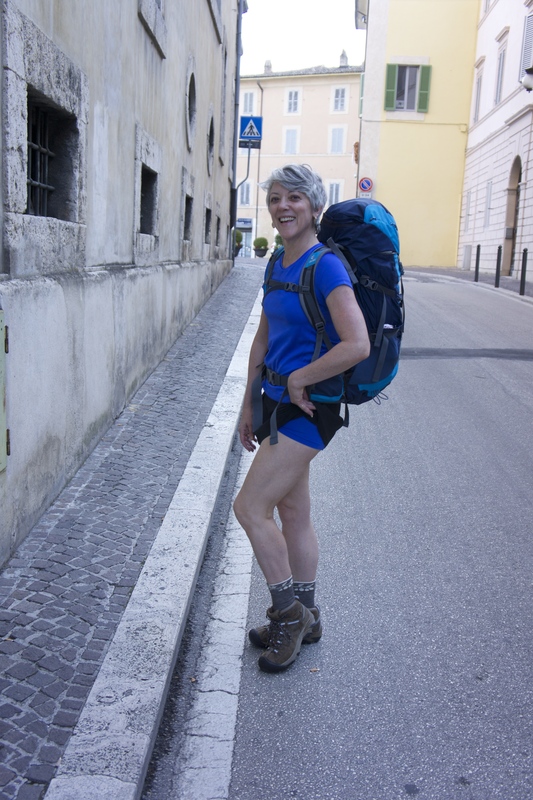 I’m not certain Italian women find the combination of skorts and pilgrim hiking boots to be leading edge fashion, runway bound, but the look attracts attention. I know it’s also that Theresa is in great physical shape and her figure brings admiring looks. All those years of yoga, dancing and good self-care have given Theresa a very athletic build. She also has excellent posture and all the things our mothers told us about standing up straight (it’ll make you look 10 years younger and 10 pound lighter) come true with Theresa. She’s just a few years younger than me, but there’s a youthful spring in her step that gives her a winsome energy, which is in distinct contrast to another unusual aspect of Theresa’s appearance. She has naturally grey hair. I noticed soon after arriving in Italy in May that the hair of Italian women never turns grey. It’s the most incredible thing. Older women, grandmothers, great-grandmothers, elderly women in walkers, gypsy panhandler grandmothers — all have hair in various shades of blonde, brown or black, surprisingly with no strands of grey or white. I began to be suspicious until it was revealed to me by an actual Italian woman — they dye their hair. All of them do it. Just as soon as any grey appears. But watching Italians watch her is not the only reason why I’ve enjoyed having Theresa with me these two weeks during my months-long Italian sojourn. What’s even more fun is that I get to see Italy through Theresa’s eyes. Theresa in skorts at the Spoleto cemetery. Take for instance her fascination with cemeteries. I’ve passed right by countless cemeteries in my pilgrimages in Spain and Italy. They’re usually on the outskirts of the villages and towns along the way and, to me, seem sad and a little eery. 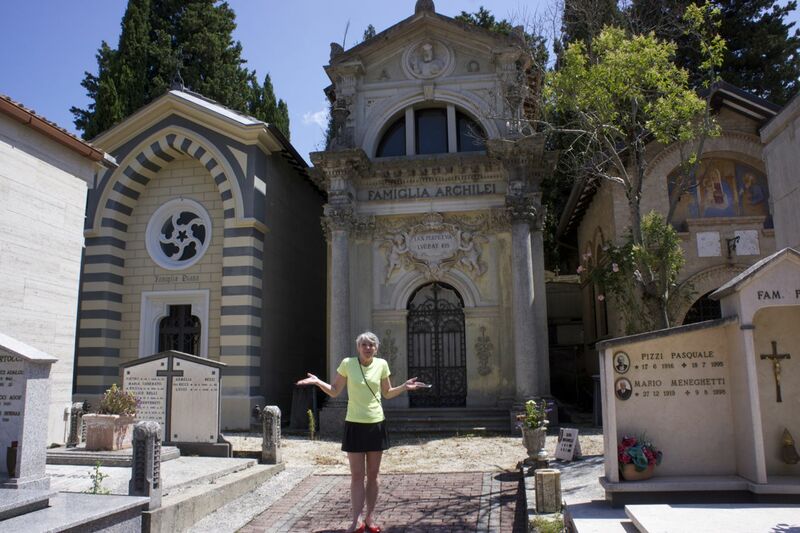 When we arrived at Spoleto and headed to the UNESCO-listed basilica, Theresa was much more interested in the cemetery nearby. She described it to me as a fascination with the little buildings, the lives and stories they held, and the care with which they are maintained. 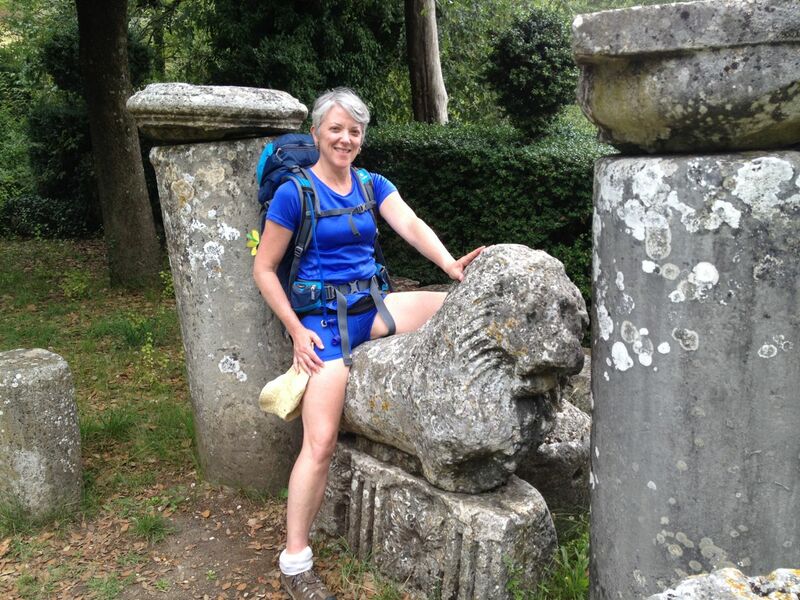 As we walked toward Rome, Theresa most looked forward to finding another cemetery to explore. It was interesting, too, to see how Theresa dealt with the issues around the pilgrimage itself. Remember, we averaged almost 15 miles of walking each day, sometimes on difficult terrain through brambles or up and down steep hillsides. Theresa’s athleticism helped her overcome every day’s challenges. More than that, she taught me some lessons about listening to your body. Pilgrimage is over. 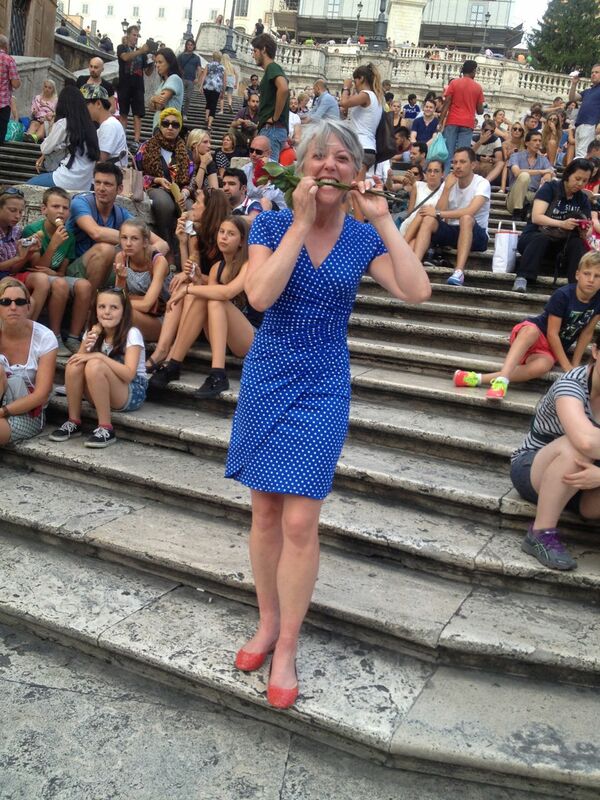 At the Spanish Steps in New Dress #2. Each day of a pilgrimage I assume I’m in for an ordeal, punctuated with beauty and meditation of course. I push my body ahead whether I’m hot, cold, hungry or thirsty and keep a uniform pace all day long, onward toward the goal. Theresa’s pace varied depending on how she felt, and she was comfortable either being in the lead or being behind by 20 meters. She was always appropriately tired after the walk, but once at the hotel Theresa would take a one hour nap, after which — no matter how long we’d walked in the day — she would bounce up and be wanting to wash clothes, shop, or explore. She is so connected to her body. I push and push, collapse in fatigue at night, and drag myself grimly onward the next day. She feeds, soothes, listens, comforts and honors her body and then is quickly ready for the next day’s challenge. During our walk Theresa overcame a couple of difficult skin rashes on her legs, as well as some sunburn on her shoulders and a few blisters on her feet. She never complained one single time. She never asked for pity or comfort. She is a very strong person and I can’t help but admire her stamina and composure. She’s also curious. As we walked she gathered a pocketful of mementoes. Some stones, a few broken tiles, a piece of jewelry and a tiny plastic arm from a child’s small doll. I trudged past each of these little treasures, not wanting to weigh myself down with extra ounces that add up to pounds. I know she will keep these shiny little objects and treasure them as part of her long walk to Rome. And of course it’s fun to be with her because, well, she’s a girl. She’s totally into the art and architecture and archeology we’ve seen along the way, but she can’t pass a dress shop without wondering if that dress will fit. Among the highlights of Rome — the Colosseum, the Vatican, the Forum, the Spanish Steps and Trevi Fountain — the dress shops could not be missed. Sure enough, we found a couple of beautiful dresses that look very Italian, which just means even more people will notice this strong, smart and pretty American woman as she enjoys her time in this Eternal City. 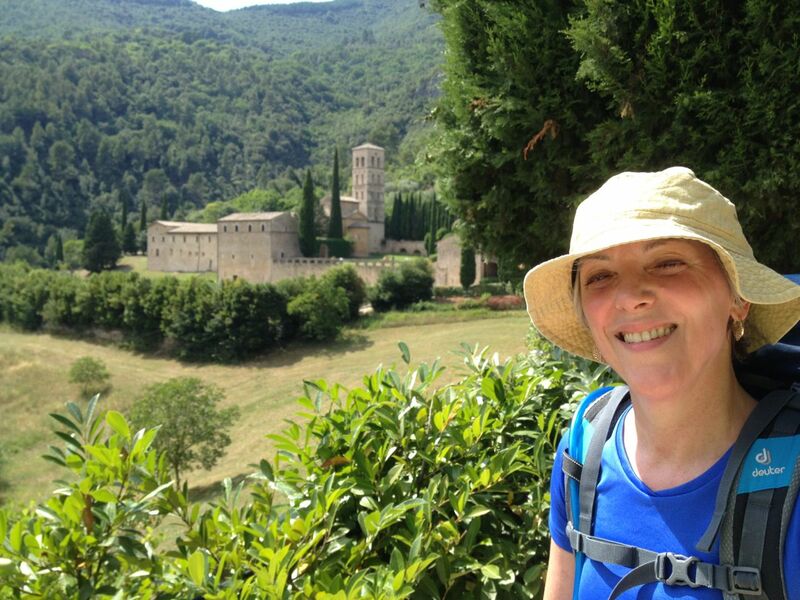 After a very long first day of hiking, Theresa is still smiling as we arrive at Abbazia San Pietro in Valle. So so happy that you two found each other!